A distinctive design reminiscent of a traditional milk pail. Milk dispenser a versatile option to enhance your buffet, catering, or hotel beverage presentation! 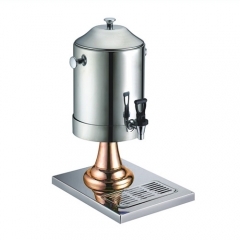 Its beautiful heavy duty, mirror-finished stainless steel body is easy to clean, while a durable, solid leg and welded construction provide added support for frequent use. Mirror finish stainless steel offers a high end look while the stainless steel construction gives you optimal durability. Complete with a contrasting black finish, this pouring spout is both stylish, durable, and won't drip after use. The domed lid is both visually appealing and features a knob on the top for staff to quickly and easily remove for refilling. 2. By Air/Sea for batch goods,Airport/Port receiving. 4. Delivery Time: 3-7 days for samples,5-25 days for batch goods.